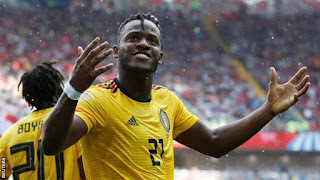 Valencia today confirmed that Michy Batshuayi will join on a season long loan. The loan fee has been variously reported as 3 million euros by Transfermarkt and 4 million by L'equipe, which is consistent with the amount that Superdeporte reported Valencia offering. Superdeporte also report that Valencia has a 50 million buy option on him. The player spent the first half of last season at Chelsea before joining Dortmund on loan, clocking up a total of 19 goals in 39 appearances for both teams, including 2 goals in 4 Champions league games. An impressive enough total in two of the top leagues in Europe. He had been heavily linked to Sevilla, so snatching him from under their nose helps us and hurts a direct rival. While some will ask what the point is in bringing in a player that we would struggle to buy, it seems a good move to me. He's an experienced and proven goalscorer, offers pace up front and, if he can help us achieve our objectives for the coming season (at least 4th in La Liga and at least last 16 of Champions league) then it'll have been worth it. Guedes' loan last year helped us reach Champions league and meant we haven't had to sell key players this summer. If the 50 million option is true then it could be within our reach if we have a good season / lose Rodrigo next summer or similar. On the Guedes front, the close of the English transfer window yesterday significantly reduced PSG's options. He's already refused to go to Napoli, no other teams in France, Germany or Italy have the funds or interest in bringing him in. Barcelona and Atletico Madrid have already spent their transfer budgets and the chance of him going to R.Madrid (who have never expressed any serious interest anyway) lessened when Penaldo left for Juventus. This looks very good for us. There were a couple of other moves yesterday relevant to us. Vietto has joined Fulham on loan. There was some talk early in the summer that maybe we would negotiate his price down, but that quickly cooled and ultimately, I'm sure we'll wish him the best of luck there. Andre Gomes, who has been linked with a return to us on loan or as a makeweight in a Parejo deal has joined Everton on loan. I doubt most of us will be that bothered. Our central midfield seems well sorted with Parejo, Kondogbia, Soler, Wass, Coquelin and Racic available (Medran is also there but looks set to join Rayo Vallecano.) Left wing is the main area to cover and Gomes is not a left winger. It's still good news for us. While he is officially a Barcelona player, even if out on loan, we still get the variables from his transfer deal: a million if Barca win the title, 0.5m if they reach Champs league quarters, a million more for the semis and 3.5m if they win it. Ultimately, I'd agree with one of the recent comments by Nickster: if we can now add Guedes, while maybe replacing Zaza with Gameiro we'll be well placed for top 4. Aside from Barcelona and Atletico Madrid, none of our rivals seems to have noticeably strengthened in this transfer window.